Live Edge Bowl with John Kingsley. #1150-0916. 1 Day. Name: Live Edge Bowl with John Kingsley. #1150-0916. 1 Day. Come create a simple turned bowl that still looks and feels rustic due to its live edge. This course is targeted to those who have an interest in learning how to turn. 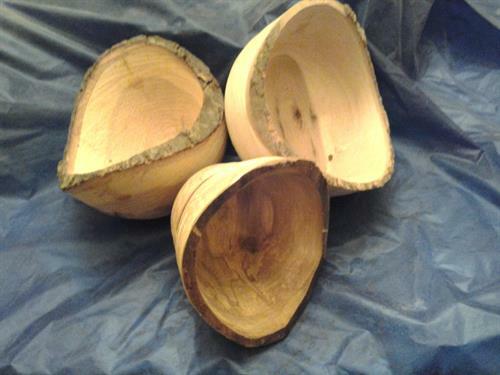 The emphasis will be on learning how to use a lathe and tools safely and correctly. In this class, you will learn the basics of creating spindle-based objects and then work at turning your bowl. Leave the class with a lovely treasure that captures the "wild" feel of the Adirondacks! NOTE:  For your safety: no loose-fitting clothes, hair tied back, comfortable shoes and no jewelry. If sensitive to wood dust registration for turning classes is not recommended. Tuition $105. Member Tuition $85. Materials fee $25.